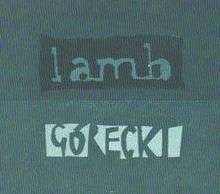 "Górecki" is a 1997 single by Lamb from their debut album Lamb. The song samples the second movement of Henryk Górecki's Third Symphony, the Symphony of Sorrowful Songs. The song has been featured in numerous TV shows, movies and video games, including the 2006 Torchwood episode "They Keep Killing Suzie" and the 1998 slasher film I Still Know What You Did Last Summer. The opening lines were sung by Nicole Kidman's character Satine in the 2001 movie Moulin Rouge!. It was also used for the launch trailer for Crystal Dynamics' game Tomb Raider: Underworld in 2008. The song peaked at No. 30 on the UK Singles Chart. Both tracks "Ear Parcel" and "Lullaby" would later appear on Fear of Fours. Both "Górecki (Global Communication Remix)" and "Trans Fatty Acid (Kruder & Dorfmeister Session mix)" were later included on the "Lamb Remixed" compilation (2005). ↑ Kozinn, Allan (12 November 2010). "Henryk Gorecki, Polish Composer, Is Dead at 76". New York Times. New York, N.Y. Retrieved 23 November 2010. This article is issued from Wikipedia - version of the 12/26/2014. The text is available under the Creative Commons Attribution/Share Alike but additional terms may apply for the media files.